This is the sort of soup that pleads to be eaten when you are feeling tired and jaded. Serve it with some warm crusty bread slathered with butter – delicious! I like to make it in the autumn when plum tomatoes are at their best and in ample supply. Place the pearl barley in a bowl and cover with cold water ensuring all the barley is covered. 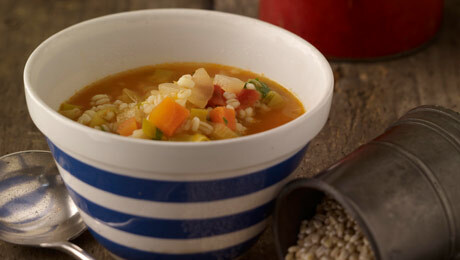 Leave the pearl barley to soak for 2 – 5 hours. Heat the olive oil in a large pan and add the onion, cabbage, leek and carrots, stirring to combine. Cover with a lid and sweat over a medium heat for about 5 minutes until softened but not coloured. Add the tomatoes to the pan, season to taste and allow to cook for a couple of minutes. Pour in the wine and allow to reduce by half, then add the stock or water and bring to the boil. Season to taste. Reduce the heat and leave to simmer for 10 minutes until all of the vegetables are completely tender and the liquid has slightly reduced and thickened. Add the soaked pearl barley and simmer for a further 20 min until the barley has soften. To serve, ladle the soup into warmed serving bowls and garnish with freshly chopped herbs.